The Blitz (short for Blitzkrieg, German for “lightning war”) began on 7 September 1940, with more than 300 bombers involved. The attacks started on the East End before moving to central London. In total, 430 were killed and 1,600 badly injured that day. What happened next we know. But life went on. London continued to be bombed. Coventry was smashed. The raids killed 43,000 civilians and lasted for eight months, petering out when Hitler began to focus on his plans for Russian invasion in May 1941. We’ve not only stuck with the Blitz. 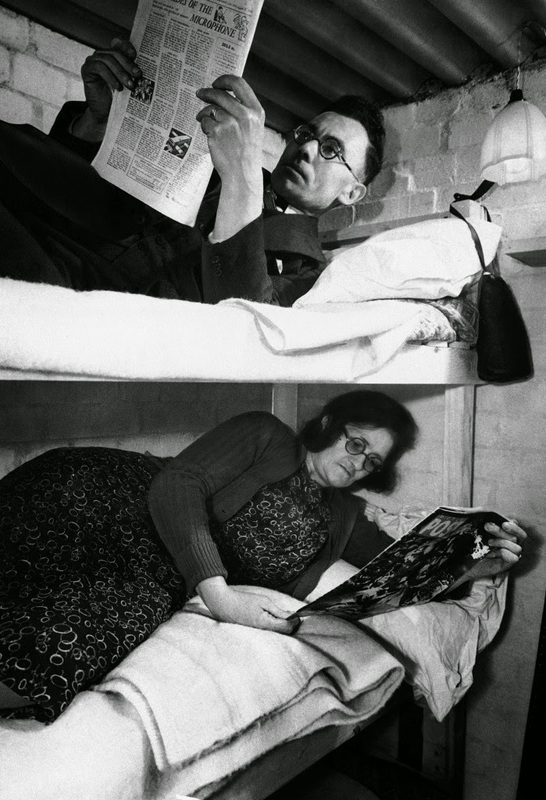 These photos show fcses on British people on the Home Front during the Second World War. 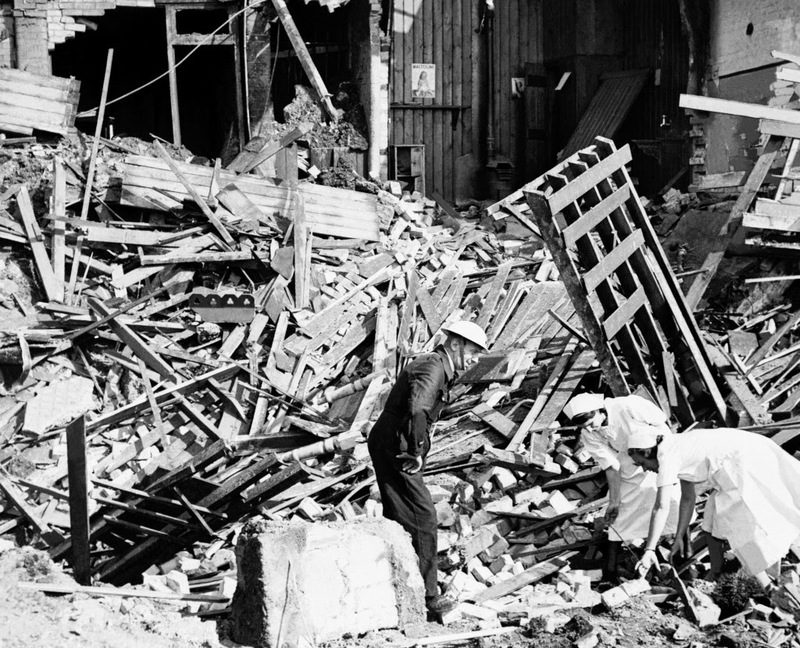 An Air Raid Prevention officer and some nurses try to salvage any vital supplies from the rubble of a hospital in London’s East End, that was hit during an air raid. 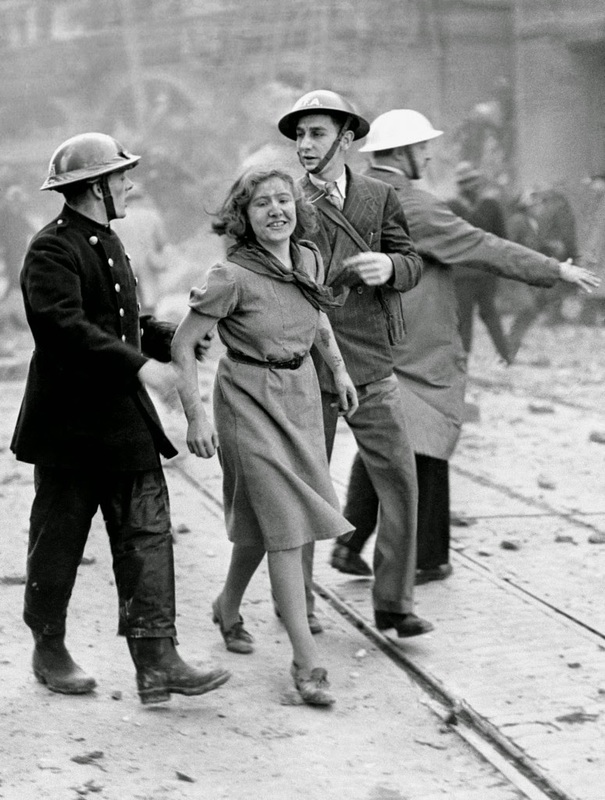 A city girl worker still smiling after being rescued from a London building just wrecked by a bomb dropped by a daylight German Luftwaffe raid. 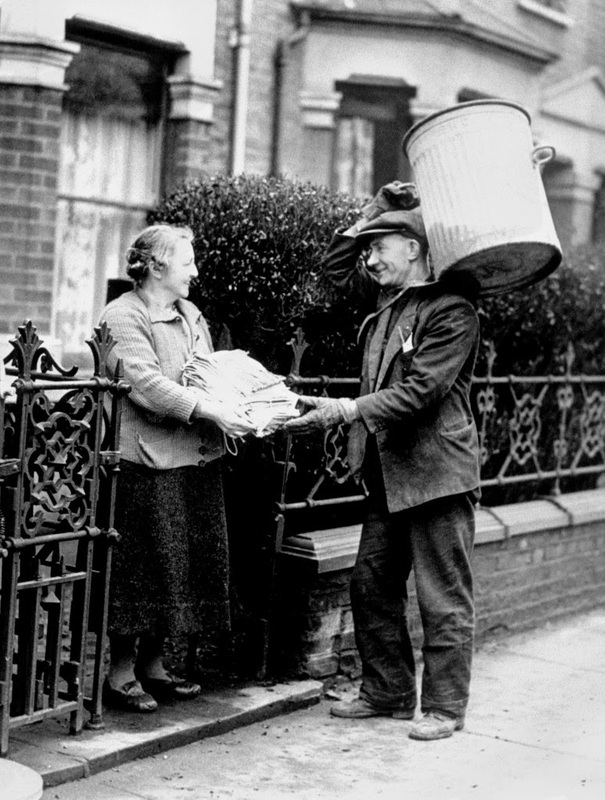 East Ham Borough Corporation have issued a pamphlet to encourage the saving of waste materials of all descriptions which are needed for the national war effort. Mr. and Mrs. Steptow and their two daughters were buried beneath the debris of their house in the London area when a bomb fell at 2.40 a.m. on Wednesday morning. It was believed by wardens that the people had gone to shelter in the underground, until tapping was heard from the imprisoned people. Rescuers at once got to work and at 1.30 p.m. yesterday, Friday. Mrs. Steptow and her two daughters were rescued. Mr. Steptow was killed when the bomb fell. 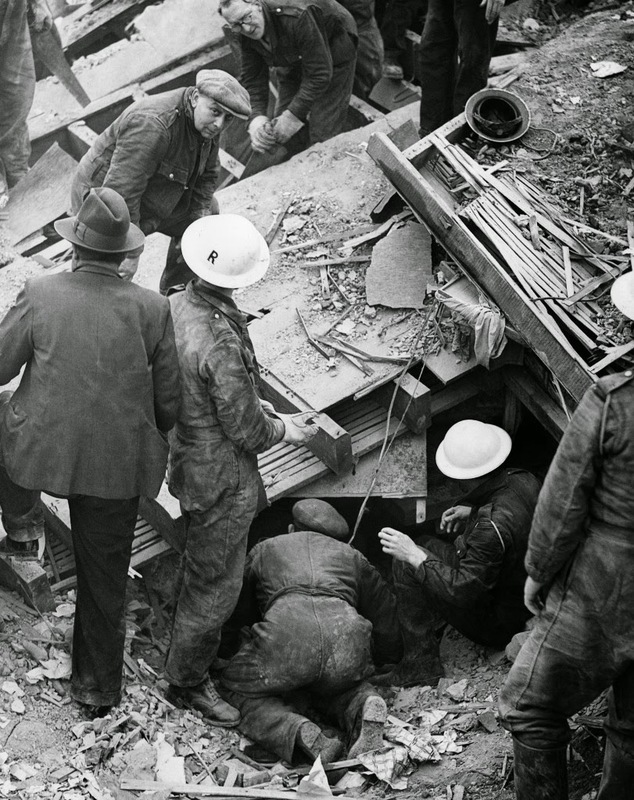 Rescue workers working to free the trapped people, Nov. 9, 1940. A nurse hand a baby to its mother in an ambulance after, bombs had driven them from a London Hospital, Oct. 27, 1940. From a choice billboard spot on London?s busy strand, this sign advocates in plain language that the R.A.F. 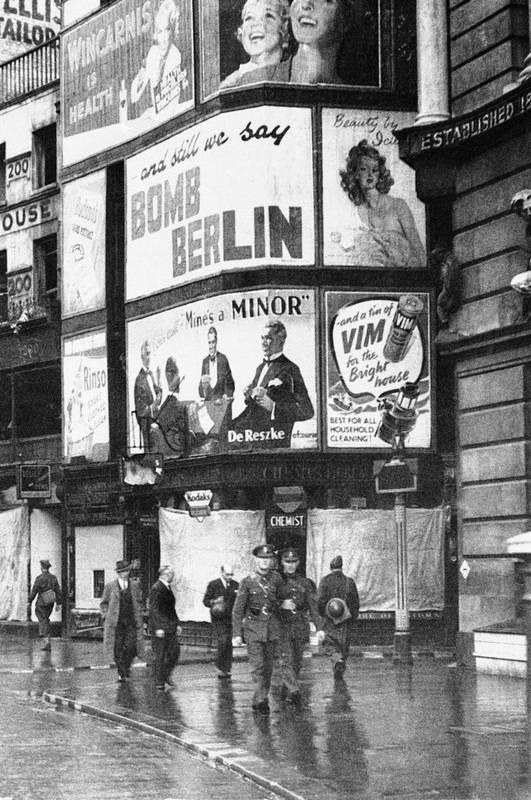 carry out reprisals for German Luftwaffe attacks in London, Oct. 18, 1940. It is one of many erected privately in various parts of London. 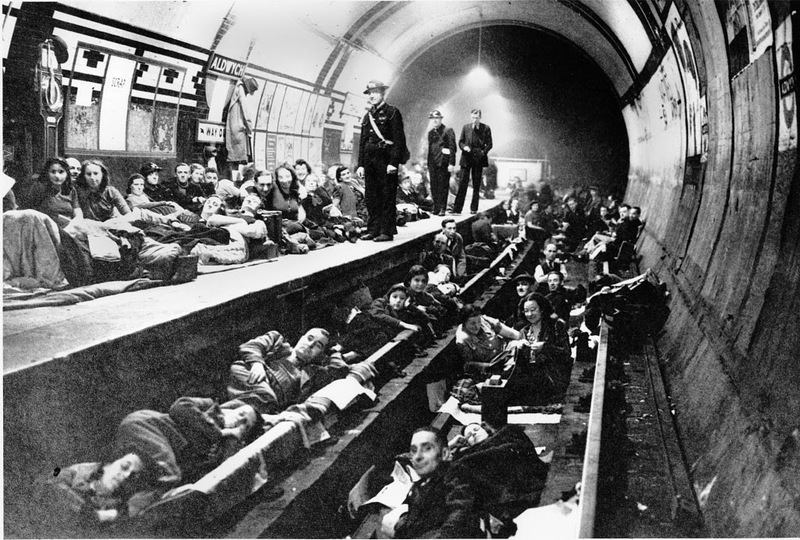 Londoners camp out for the night at the tube along the platform and train tracks during heavy bombing by the Germans in London, England, on Oct. 21, 1940 in World War II. 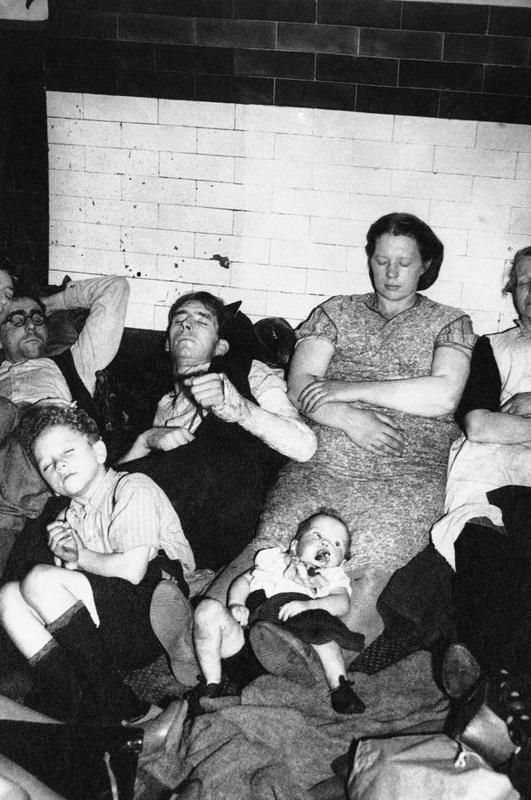 Families fled their homes at the sound of the air raid sirens, and will remain here until the air raid wardens notify them of the all-clear signal. 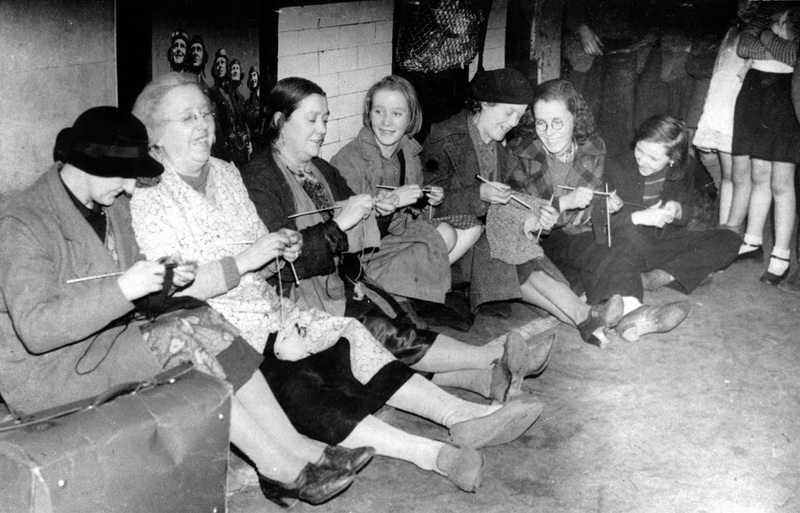 Women knit and talk as they seek shelter in the tube station during heavy bombing by the Germans in London, England, in 1940 during the blitz in World War II. 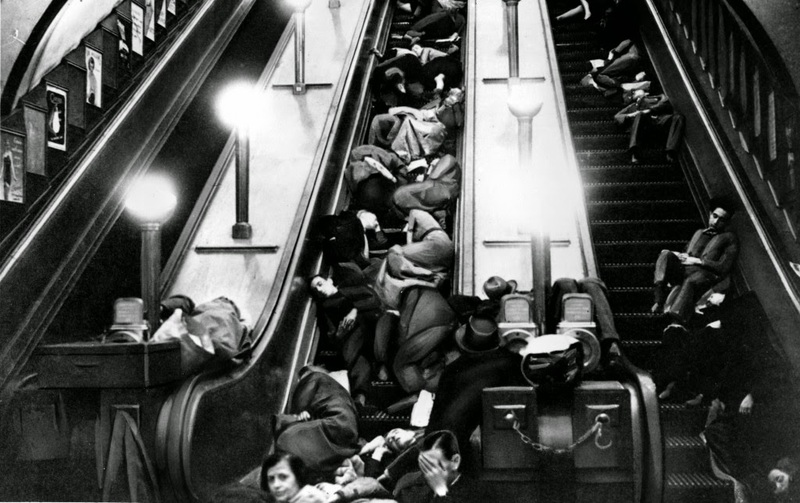 Londoners sleep on stopped escalators of a tube station for safety and shelter during heavy bombing by the Germans in London, England, in 1940 during the blitz in World War II. 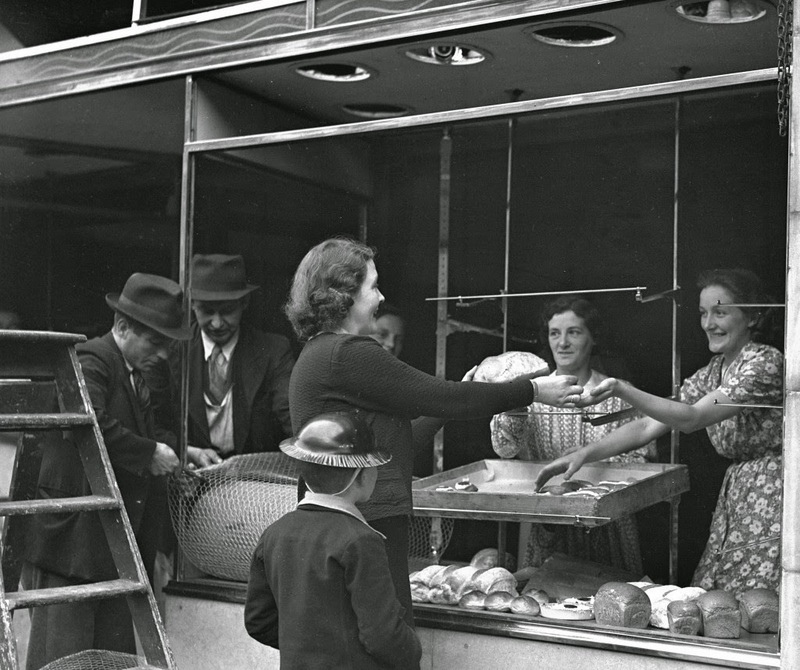 This is typical of the way Londoners had breakfast in England, Sept. 6, 1939, after the air raid warning had sounded. Breakfast was in the family dugout–this one in a garden?with a gasmask hanging ready. 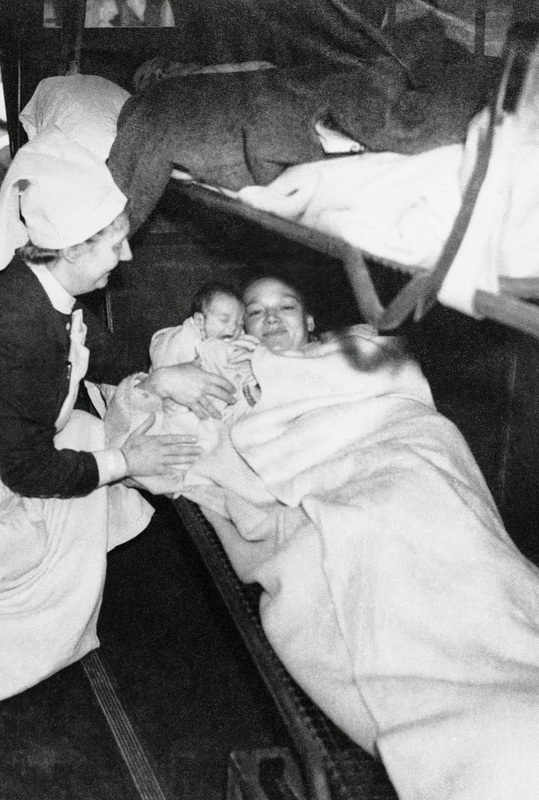 A nurse hand a baby to its mother in an ambulance after, bombs had driven them from a London Hospital, Oct. 27, 1940. If the baby?s a girl, she has a good chance to be named ?Siren?, a favorite since the British capital went under German bombardment. 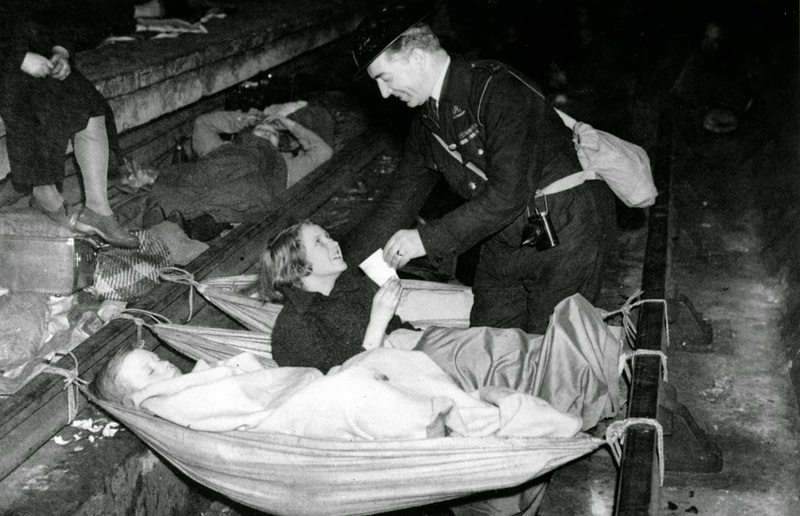 An air raid warden brings a drink of water for a young girl who has awakened during the night in an air raid shelter at the Aldwych tube station in London, England, Oct. 21, 1940 during the blitz in World War II. Hammocks are slung across the train tracks for sleeping. 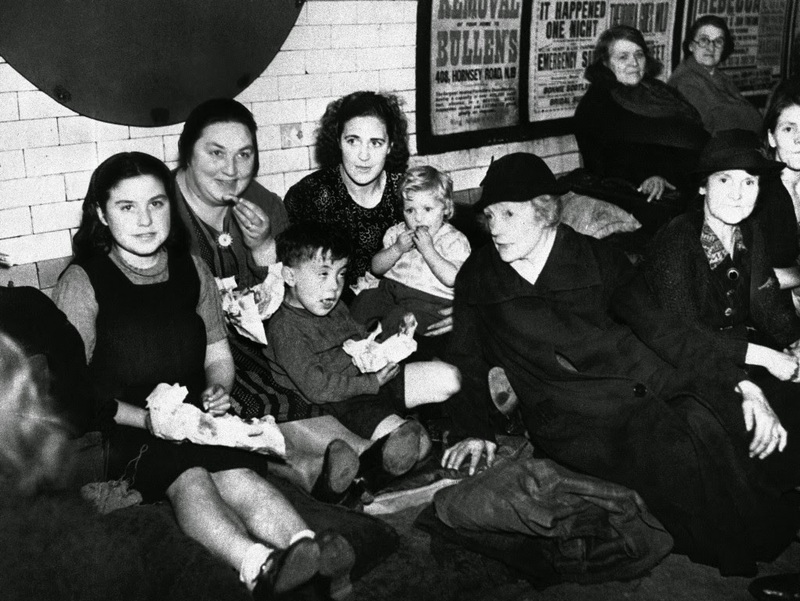 An air raid warden passes among Londoners in a subway shelter in London, Oct. 21, 1940, collecting funds to pay for more spitfire pursuit planes to help defend the capital and strike back at England?s enemy. A small child makes a contribution as other air raid wardens look on. 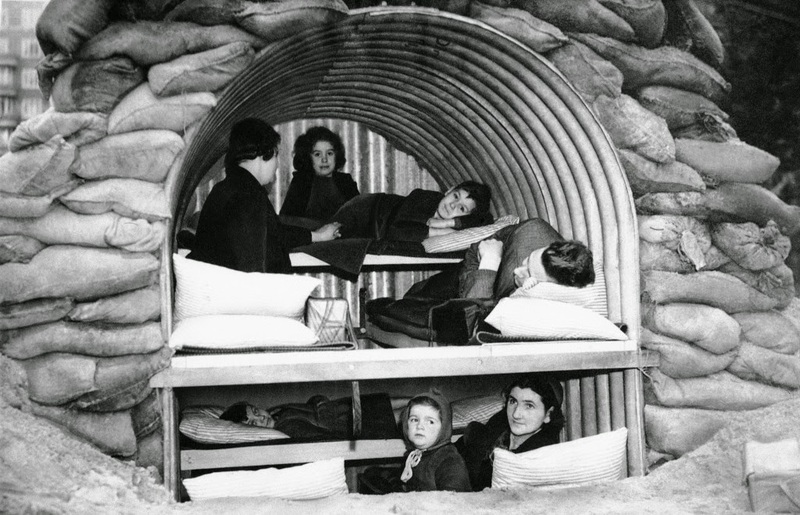 An Anderson shelter fitted with bunks to hold four adults and four children, Oct. 11, 1940. 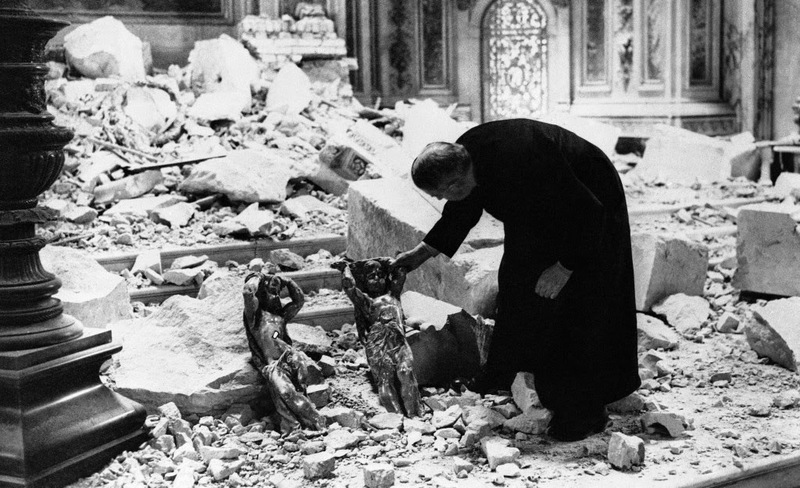 One of the clergy of St. Paul?s cathedral in London looks at two cherubs standing among the debris and holding their heads as though for protection, Oct. 10, 1940 in London. The destruction was caused by a bomb. St. Paul’s cathedral in London, Eng. 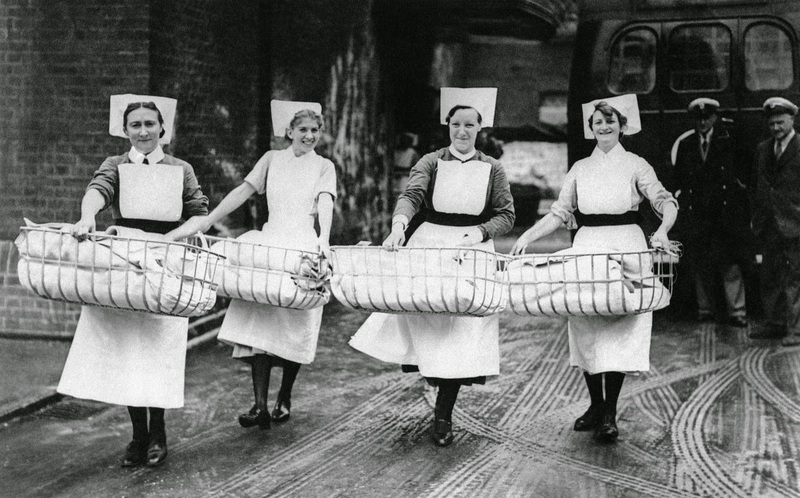 Nurses carry cribs containing newly born babies, the maternity section of a southeast London hospital was evacuated,+ Sept. 16, 1940 after being bombed by German raiders the night before. 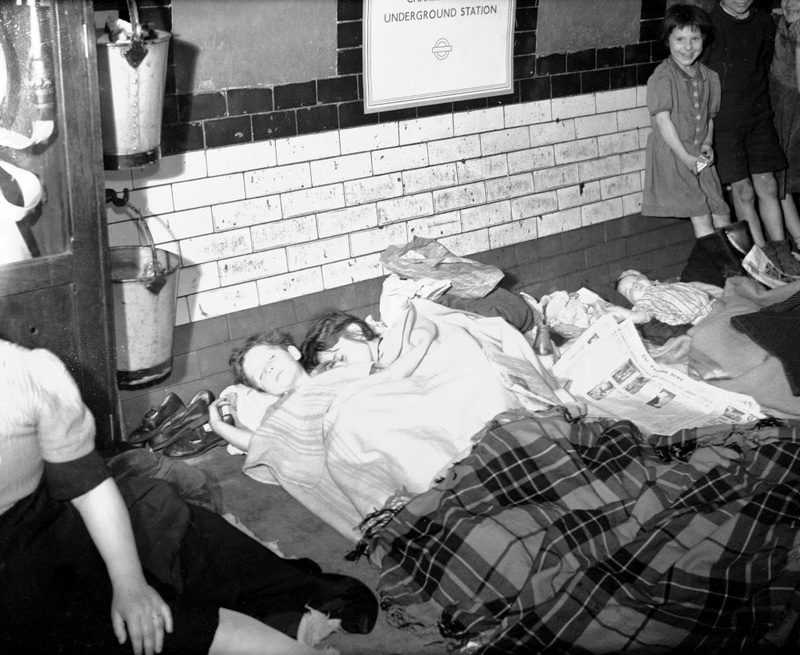 Children sleep on the platform of a London Underground station, where they are sheltering with their families during the all night Nazi bombing raids. 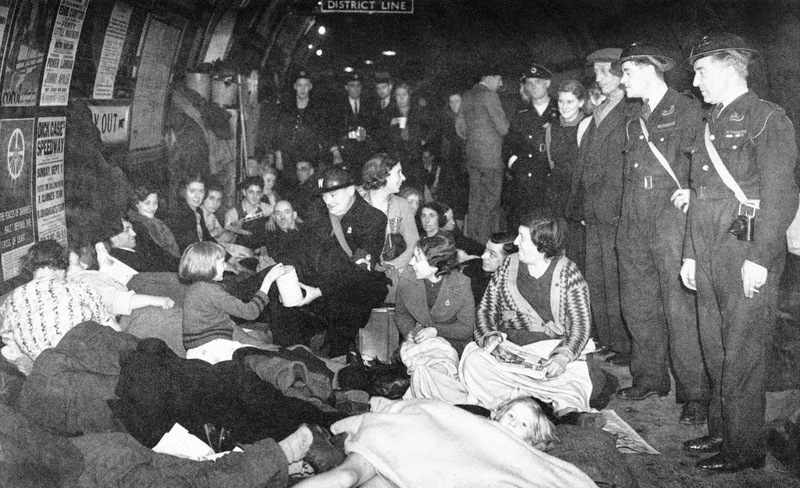 Deep underground, thousands of Londoners nightly wait out the danger of German air raids on the capital in London, Oct. 1, 1940. 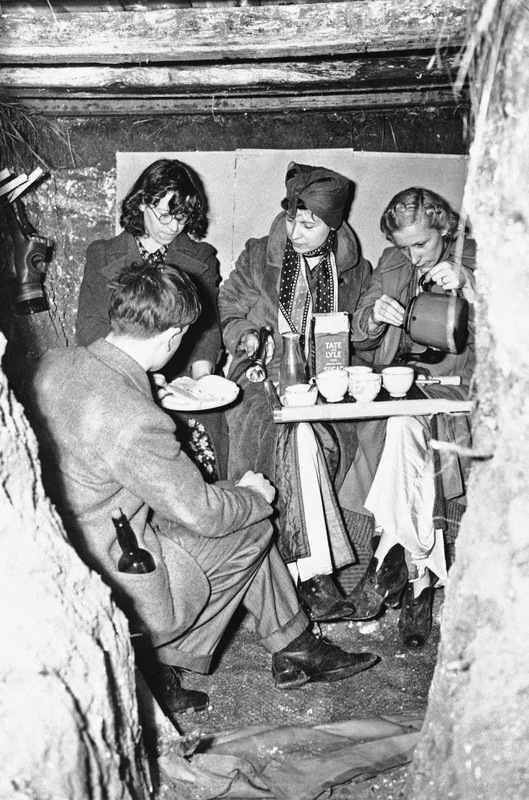 The bomb fugitives break the monotony of a night-long wait with luncheon underground. 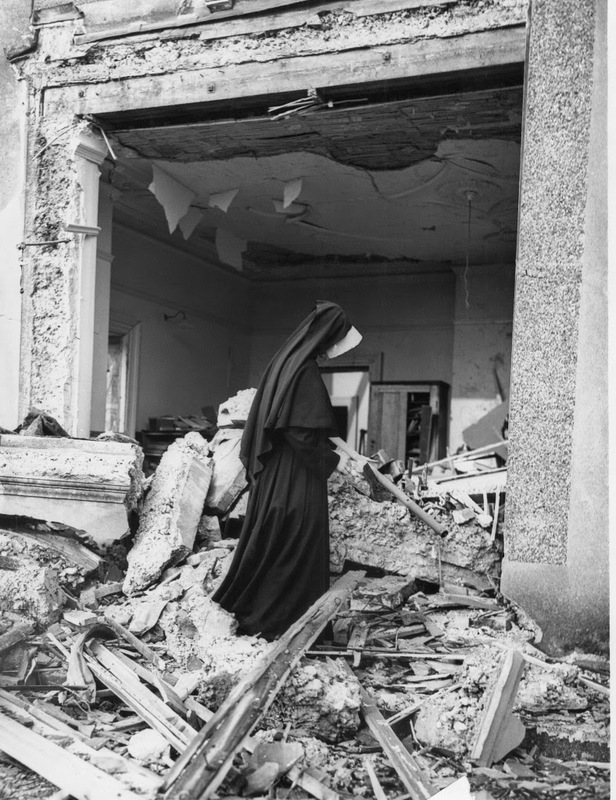 A nun at a convent school in the home counties inspects the damage done to one of the classrooms after a Nazi bomb hit the school during a night raid in London, March 21, 1941. Five nuns were injured during the bombing. 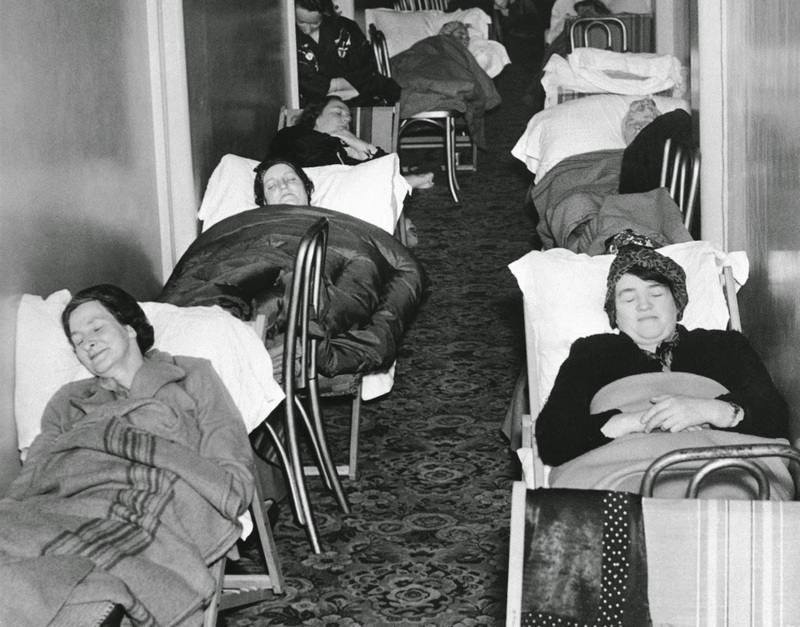 Women sleep in a corridor of the Grosvenor house hotel in London, Dec. 17, 1940, their bodies stretched over chairs and deck chairs. 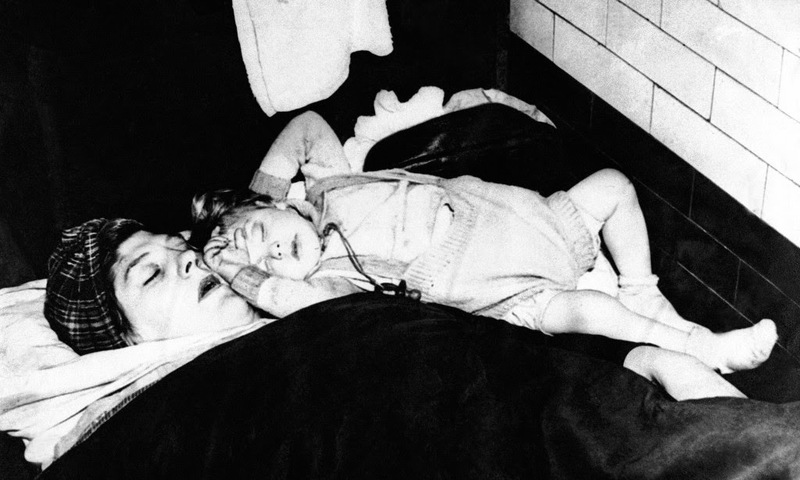 young mother and her child sleep soundly in a London subway shelter, Sept. 28, 1941, according to British sources. 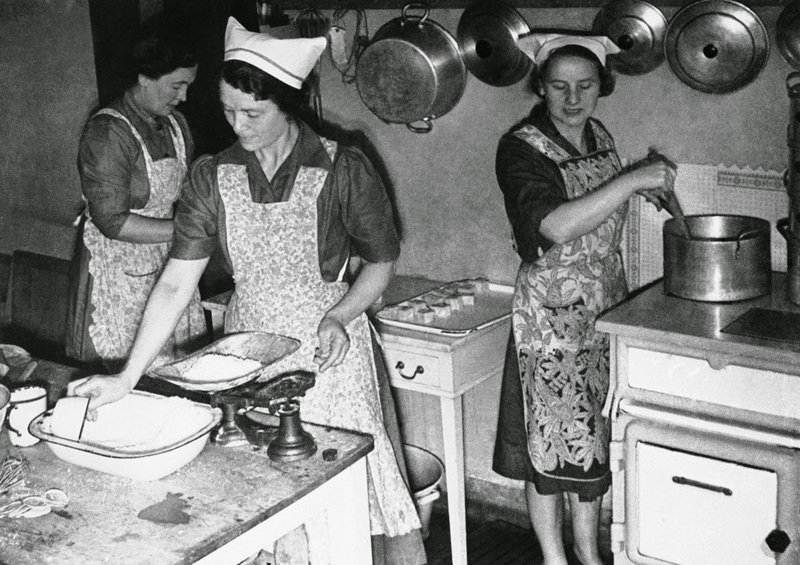 Voluntary workers in the communal kitchen preparing meals, some of which will be eaten by employees in nearby factories in London on Sept. 17, 1941. Others are taken in a mobile canteen to crippled, aged and homeless folk. The canteen normally operates during enemy raids. 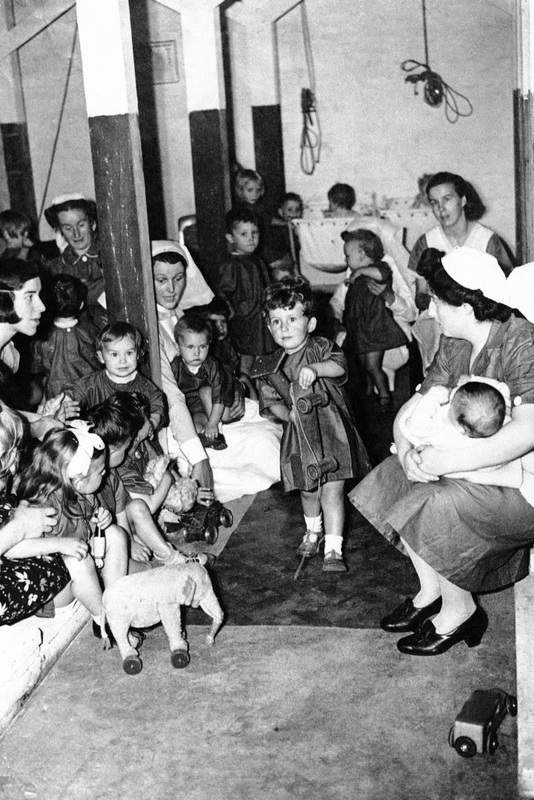 It is sent around on mercy errands to feed the poor and infirm during the lull in the blitz. 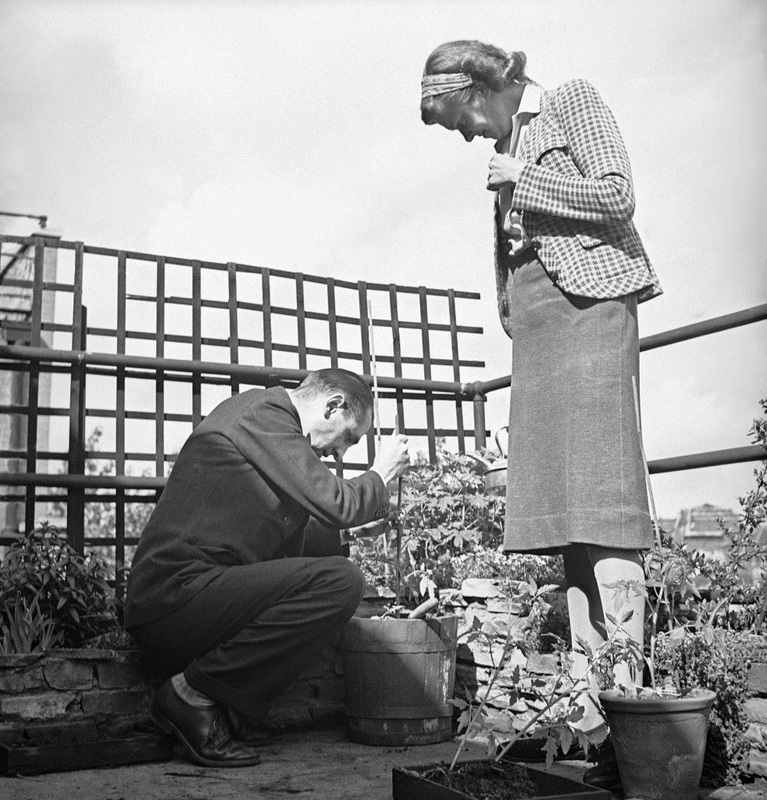 Robert Bunnelle, Chief of the London Bureau of the Associated Press, sets out a young tomato plant in an old butter tub in the roof garden of the apartment house in London on June 10, 1942 where he lived through the 1940-41 German blitz on the city, while Mrs. Bunnelle looks on with critical eye. 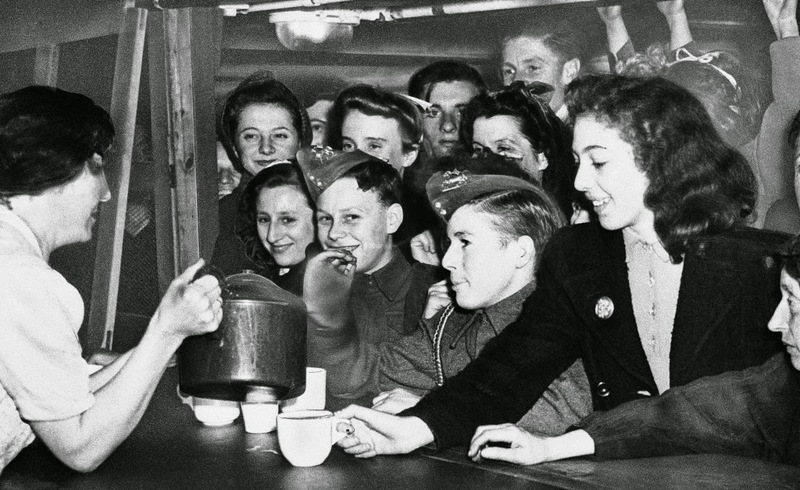 Tomatoes sell for fifteen cents a pound in wartime London. The Bunnelles’ apartment is in the central London District of Kensington. 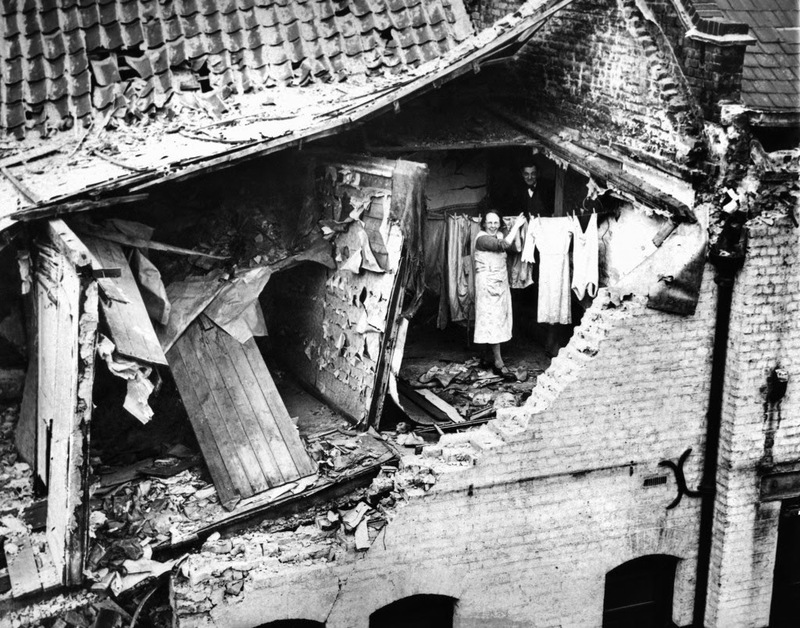 despite the condition of the structures, damaged by aerial bombs, this London housewife gets her washing up to dry, Monday, May 28, 1941 in London. 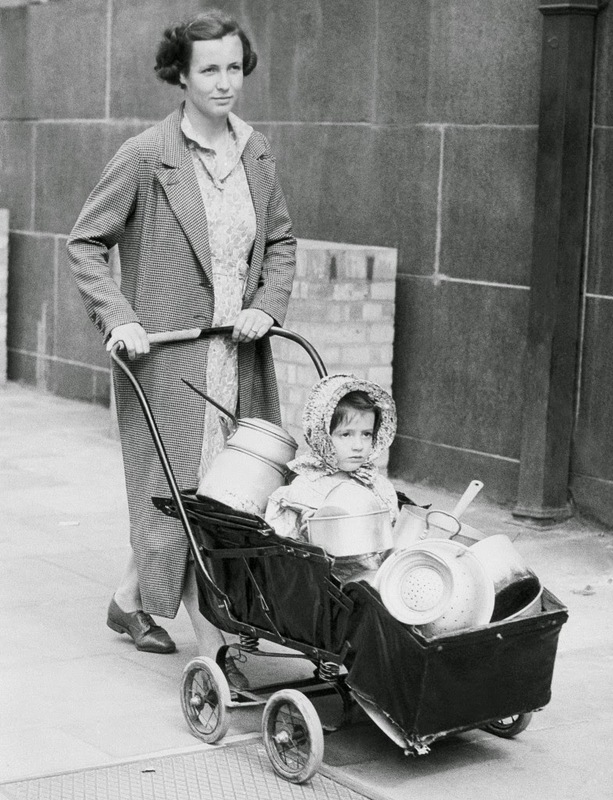 A housewife and her baby rings her contribution of pots and pans to Chelsea Town Hall, London, Oct. 7, 1940 after Lord Beaverbrook made an appeal to the women of Britain to give their aluminum pot and pans to be convert to into spitfires and hurricanes. 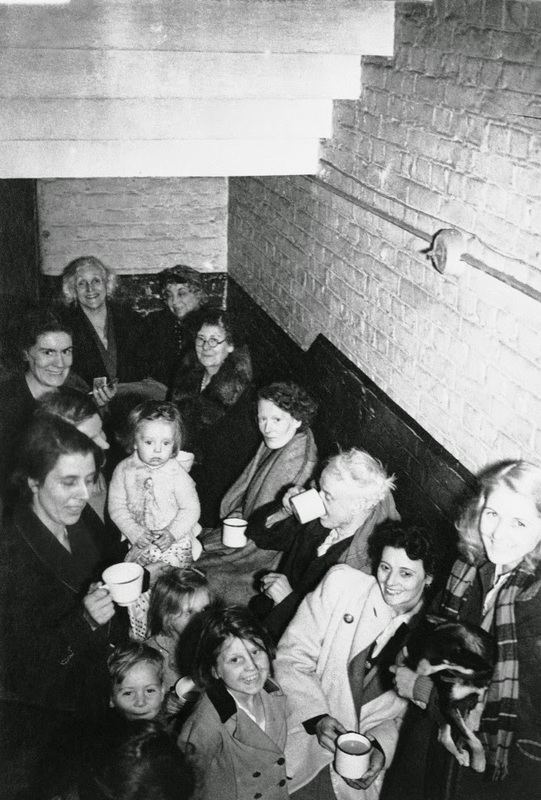 Young Londoners, in a shelter against Hitler’s robot bombs, crowd the canteen for refreshments, deep under the city of London, July 25, 1944. When completed, the shelters will provide sleeping accommodations for 40,000 persons. 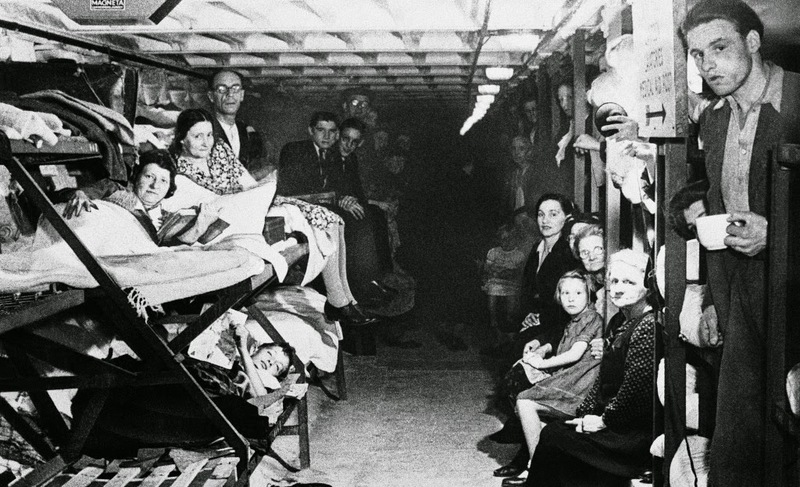 Deep in tubes underneath underground railway lines in London shelters provide safety from buzz bombs, July 25, 1944. Shelters prepare for bed. 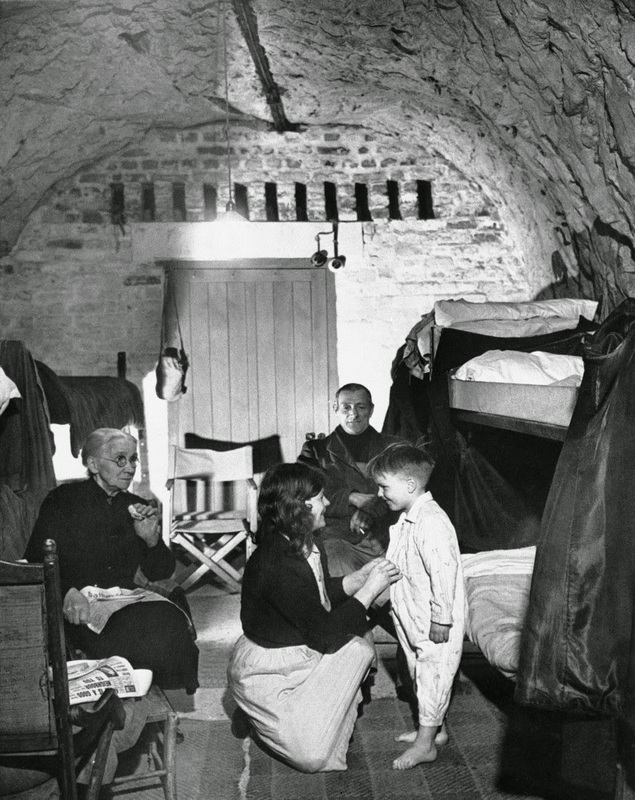 Five-year-old David Day is prepared for bed in his home is a cave in Dover?s chalk cliffs on the English Channel Coast in Dover, England, April 19, 1944. About 90 of the city?s residents have become permanent residents of caves to evade danger and harm from German shells and bombs. David remembers no other home, having become a cave dweller at five months of age. 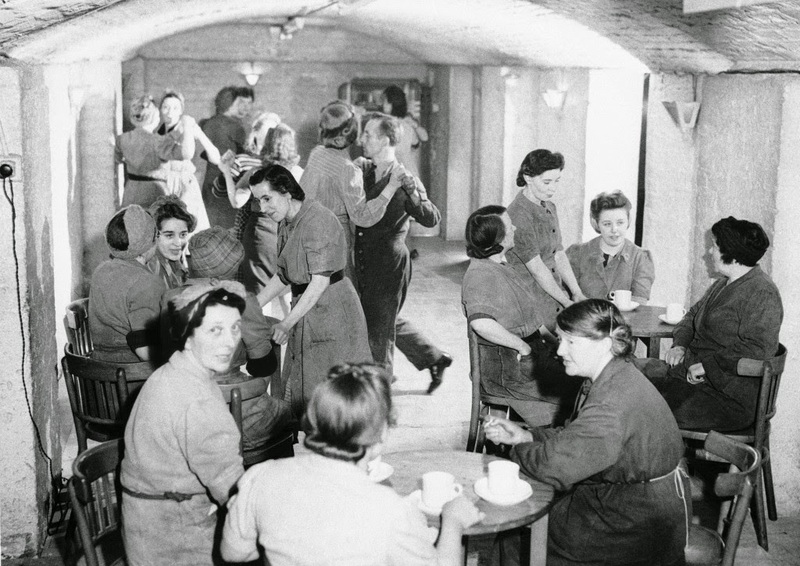 The underground factory’s night club is a simple affair where some of the workers drink tea while others dance somewhere in England, April 11, 1944. A row of smiling faces nurses, calm and cheerful; look out, Sept. 9, 1940 in London. 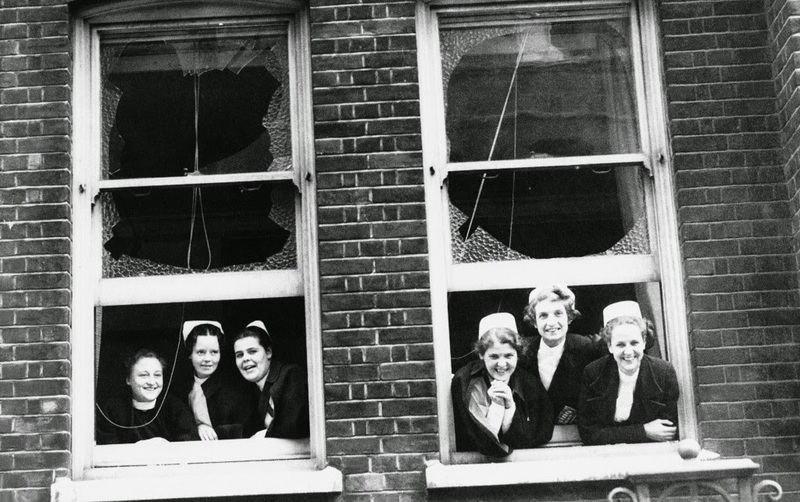 Through the broken windows of their damaged home a high explosive bomb fell on their East London Hospital last night but all were safe in their shelter and there were no casualties. 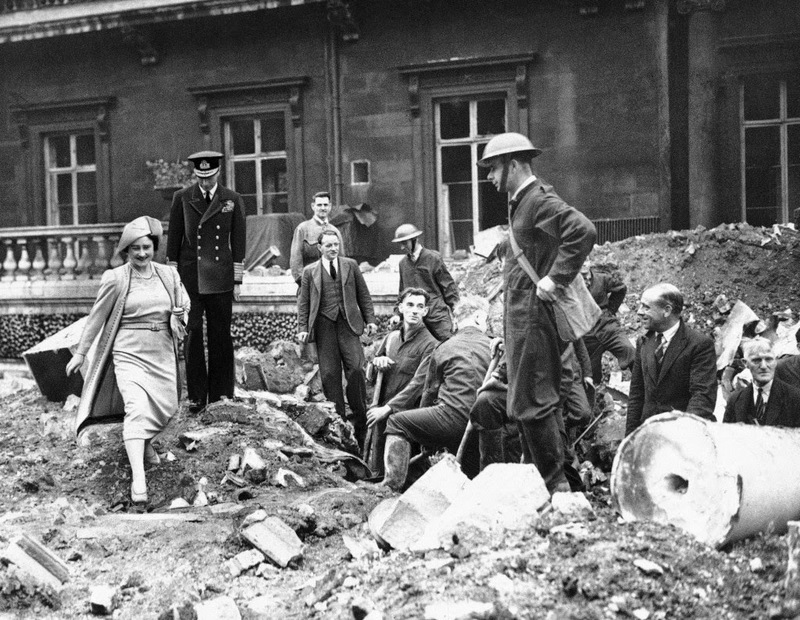 Queen Elizabeth, left, followed by the King, inspected the wreckage of Buckingham Palace caused by the explosion of a German time bomb, Sept. 10, 1940 in London. The bomb, believed to be a 250-pounder, fell near the Belgian suite. 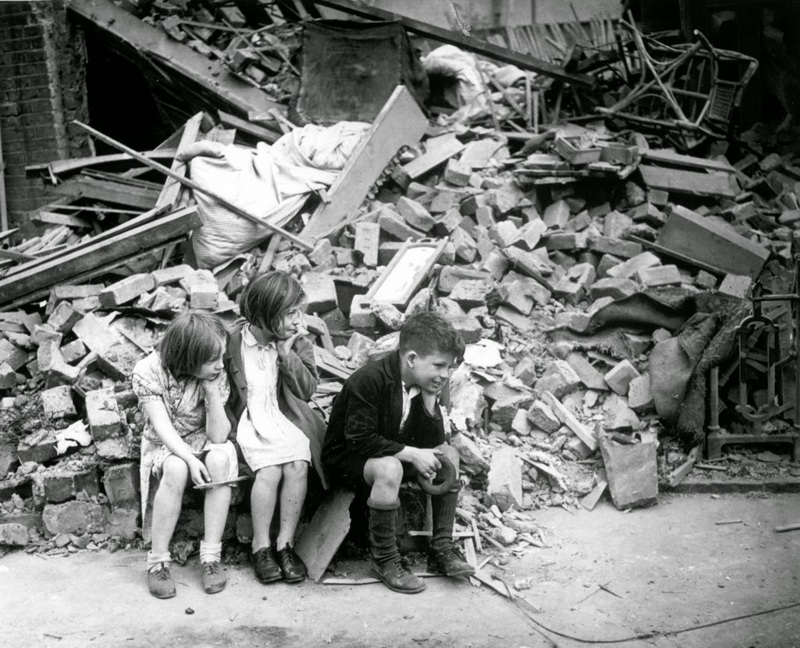 After another night of German bombings in September 1940, three children are sitting next to the remains of what was once their home in East London, in the early days of the Blitz during World War II. Bread is sold at this bakers, through the remains of the window, whilst repairs are being done on damage caused by a Nazi bombing raid, in London, Aug. 23, 1940. A morning scene in a London suburb: after most of the night spent in the shelter morning sees this little party of women and children having breakfast, August 3, 1940. Pancras day nursery for has an A.R.P. bomb-proof nursery tom in London, August 2, 1940 to which the children are trooped daily, singing ?now we go down the steps again? and thinking it a royal game. 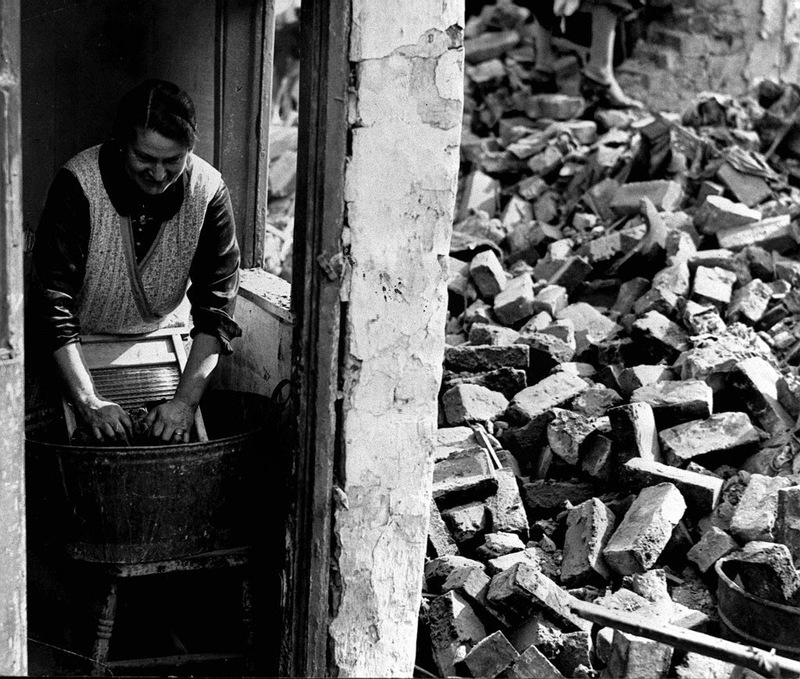 THE BLITZ 1940: Washing day as usual, using a washboard and tin tub, in the East End of London despite the damage caused by Luftwaffe bombing raids on the British capital.